Roman shades are a traditional fabric window covering that still provides a great casual look whether you have a long bank of windows or just that one small window in the powder room. 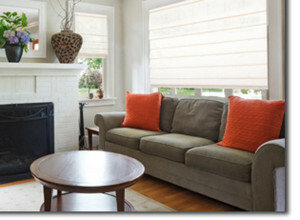 Roman shades are also energy efficient and include a matching valance. Select from a variety of fabrics, colors and light filtering options such as semi-sheer, translucent and blackout fabrics. The Shutter Guy is an authorized Hunter Douglas dealer and offers free in-home consultations where a personal design consultant will help you select the perfect color, fabric and trim to create a custom look at a VERY affordable price. 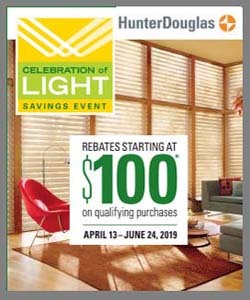 We carries Roman shades from Hunter Douglas and other top manufacturers such as Vista Products and Horizon Window Fashions, just to name a few. Shutter Guy offers a large selection of Roman shades in the Charleston, SC area. We also serve Goose Creek, Summerville, Isle of Palms, Sullivan’s Island, Folly Beach, Mt Pleasant, Seabrook Island, Myrtle Beach, and surrounding areas.